With the Kreg Deck Jig and a few simple tools you already own, you can create a beautiful and functional deck surface, completely free of exposed fasteners and painful splinters! 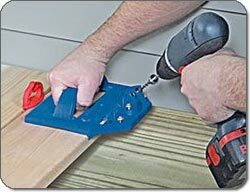 The Kreg Deck Jig creates an incredibly strong wood-to-wood bond through precisely placed self-tapping screws. Works great with composite deck boards and ACQ treated lumber. Also works with native softwoods such as redwood, cedar and pressure-treated pine. Even works with certain tropical hardwoods like ipe, red balau, and ironwood. Easy-grip handle gives you a secure hold and complete control over each and every joint. Hardened steel drill guides keep special stepped bit and driver bit at precise, optimal angle. Three separate drill guides let you install deck boards in a variety of hard-to-reach areas. Handy spacer rings ensure accurate deck board spacing for proper drainage and longer deck life.The Deck Jig System includes: Deck Jig, 6″ Deck Jig drill Bit with stop collar, 6″ KTX square driver bit with stop collar, 5/16″ spacer rings (3), 1/4″ spacer rings (3), Protec-Kote deck screws (100), Instructional DVD and Durable carrying caseThe Kreg Deck Jig helps you get the deck you want, without any unsightly exposed nails or screws. Designed to work exclusively with 4/4 to 5/4 (3/4-inch to 1-1/8-inch) composite stock without machined grooves, the Deck Jig’s specialized self tapping screws are driven at a precise angle into the edge of your deck boards so they stay hidden from view. An easy-grip handle gives you a secure hold with complete control, and hardened steel drill guides keep your specialized stepped bit and driver bit at the precise, optimal angle. For added convenience, spacer rings ensure accurate deck board spacing and three separate drill guides let you install deck boards in a variety of hard-to-reach areas. Easy-grip handle gives you a secure hold and complete control. Whether you’re building a new deck or refinishing an old one, with the Kreg Deck Jig and a few simple tools you can create a beautiful and functional deck surface, completely free of exposed fasteners and painful splinters. Traditional concealed decking systems utilize awkward steel fasteners or thin plastic clips to hold your deck boards in place. The Kreg Deck Jig takes a more straightforward approach, creating an incredibly strong wood-to-wood bond through precisely placed self-tapping screws. No exposed nails or screws. The Deck Jig’s specialized self tapping screws are driven at a precise angle into the edge of your deck boards so they stay hidden from view. Whereas seasonal changes might force traditional fasteners out of place with time, Kreg screws stay protected safely below the surface. 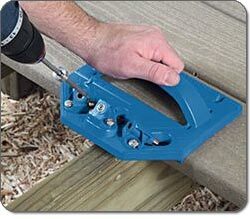 Even better, securing a deck board with the Kreg Deck Jig takes only three simple steps–just drill holes, drive the self-tapping screws, and you’re done. The Deck Jig works best with composite materials, but it’s also compatible with native softwoods such as redwood and cedar, along with certain tropical hardwoods like red balau, and ironwood. Please note: It works exclusively with 4/4 to 5/4 (3/4-inch to 1-1/8-inch) stock and is not designed for use with 2x material including 2x4s, 2x6s, 2x8s, etc. This kit comes with Kreg Deck Screws with Protec-Kote. Designed specifically for use with the Kreg Deck Jig, these Protec-Kote screws feature three anti-corrosion layers which protect against rusting in a wide variety of decking applications. And like all Kreg Deck screws, the ones included in this system feature a KTX #1 square drive to reduce cam-out, a flat-bottom head which resists splitting, and a self-tapping tip which drills its own hole as it’s driven. The Kreg Deck Jig is backed by a lifetime warranty. Deck Jig, 100 Protec-Kote deck screws, instructional DVD, 6-inch Deck Jig driller bit, 6-inch KTX square driver bit, three 5/16-inch spacer rings, three 1/4-inch spacer rings, two stop collars, one allen wrench, and carrying case. Great product – makes a beautiful deck surface! Overview of how the deck jig can be used.